You may not have heard about Charley’s before. They don’t have a Jared who talks about losing incredible amounts of weight, and they don’t have odd commercials with talking hands raving about their toasted sandwiches. Instead, Charley’s Grilled Subs has purely delicious sandwiches to bring in the customers. Founded in 1991, Charley’s has been expanding across the United States and even has a store in Japan. A few nights ago, a friend and I decided to give Charley’s a try, and fortunately there was one in a nearby shopping mall. From the moment we walked up to the store, this was probably one of my best experiences in a sandwich shop ever. This may be due to the fact that it was a Tuesday night and the crowd was light but it didn’t matter. From the person who greeted us with samples of the Chicken California to the fries guy who gave me my side of ranch dressing, everyone was extremely nice and helpful. 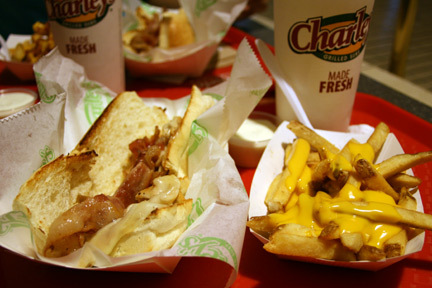 Charley’s Grilled Subs started with the founder’s love of the Philly Cheesesteak, and the passion for the sandwich is reflected in the menu. 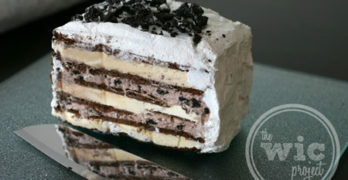 They offer the traditional Philly Cheesesteak and have also expanded to include grilled chicken and turkey sandwiches. They even have a Philly Veggie sandwich for those who aren’t meat inclined. Prices at the local Charley’s ranged from $4.99 to $5.49 for regular sizes and the larger sandwich sizes were $1.50 more. I could add extra meat for $1.50 and extra cheese for $0.50. If you want to turn your meal into a combo meal, then I could add a drink and fries for $2.29 for the fries combo or go for a drink and gourmet fries for $3.29. I opted to get the Bacon 3 Cheese Steak, which is $5.49 for a regular size ($7.99 for a large) and turned it into a Gourmet Combo with a drink and Bacon, Cheddar and Ranch fries. After placing my order, the assembly line of Charley’s workers began. The cashier started my beverage while the fries guy started scooping and topping my fries. I thought the sandwich making experience was unique because you saw them both heat up your meat and then pass it on to the person who topped your sandwich with the toppings you wanted. There wasn’t a microwave or conveyor that “toasted” your sandwich – it was an open grill that they threw the meat on while you watched it sizzle. A few moments later, I was walking away with my hot steak sandwich and fries. Let me say that I LOVED this sandwich. It tasted like a gourmet bacon cheeseburger, only the steak was more tender and each bite really burst with flavor. I asked them to hold the provolone cheese so enjoyed a Bacon 2 Cheese Steak. The bread was amazing as well. It had the nice crunchy outside of French bread, a crispy toasted inner side while the bread itself was soft and fresh. The fries themselves were awesome as well. They have the nice crunchy outside texture as shoestring fries but the nice gooey insides of steak fries. They are perfectly cooked and don’t suffer from the mushy feeling that other french fries fall victim to. 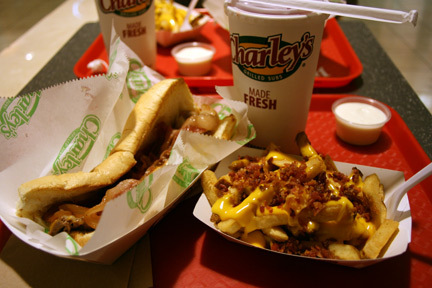 Charley’s offers both regular and gourmet fries, where your gourmet fries include cheese, cheese and bacon, ranch and bacon, or cheese, bacon and ranch. At the store I visited, the Original Fries were $1.79 and the Gourmet Friest cost $2.79. If there was anything I would tweak, it would be for Charley’s to use a different cheese on their gourmet fries. My friend got a Chicken Bacon Club Sandwich. His sandwich was $5.29 for a regular ($7.79 for large) and he turned it into a gourmet combo as well with a drink and cheddar fries. He enjoyed his sandwich just as much as I did. He ate it so quickly that I almost didn’t get a chance to sample a bite. Again the bread was delicious and I was amazed at how good the chicken was. It didn’t taste dry and it wasn’t cold like other sandwich shops’ chickens. Instead the chicken was tender, moist and flavorful. My friend agreed that the fries were good but would probably forgo the cheese next time. Interestingly, the end of my meal was just as pleasant as the start. I wasn’t able to finish my sandwich so I brought the left overs to the counter to ask for a to go bag. Instead of throwing a bag at me, they took back my fries and my sandwich and then individually wrapped each item and placed it in the bag. Plus I got a free drink refill of Tropicana Fruit Punch (YUM!) I know those seem like little things, but compare that to your experience at some other sandwich stores and you’ll understand why Charley’s service stands out. Again, I don’t know if this is standard Charley’s policy or if it’s just the store at my mall – but it’s something that I appreciate. I know that in many mall eateries, there are umpteen different restaurants to choose from. I’ve passed Charley’s several times before, since I was unfamiliar with the brand and unsure about the food. After my recent trip to Charley’s my opinion is 100% changed. I won’t be waiting in line for “happy happy” teriyaki chicken or for mystery chicken fingers. Instead I’ll be racking up credits on my sandwich card, working my way towards a free Charley’s cheesesteak. 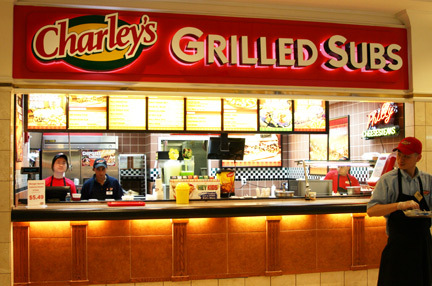 Charley’s Grilled Subs is a great solution for lunch or dinner with fresh, hot, and delicious sandwiches. To learn more about Charley’s and to find the location nearest you, please visit www.charleys.com. Disclaimer: This post consists of my (and/or fellow tester) opinions only. No compensation was given for this review/giveaway. I did receive $10 in Charley’s gift certificates from the manufacturer or representing PR agency to use and test for the purposes of this review. This did not affect the outcome of this review.